"An Old Walrus, Or 'Morse' " was drawn by Henry Wood Elliott in 1872. He included it in his book Our Arctic Province, next to a description of a walrus haulout in Alaska's Punuk Islands in 1874. 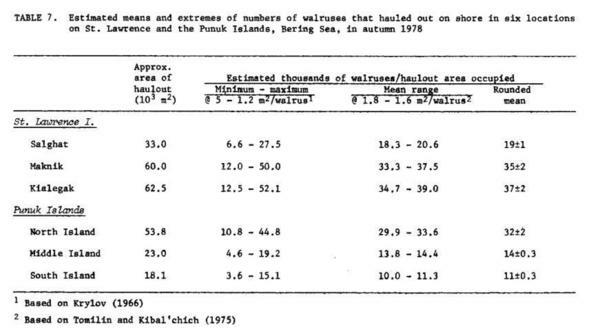 From "Mass Natural Mortality of Walruses (Odobenus rosmarus) at St. Lawrence Island, Bering Sea, Autumn 1978," in Arctic Vol. 33, No. 2 (June 1980). 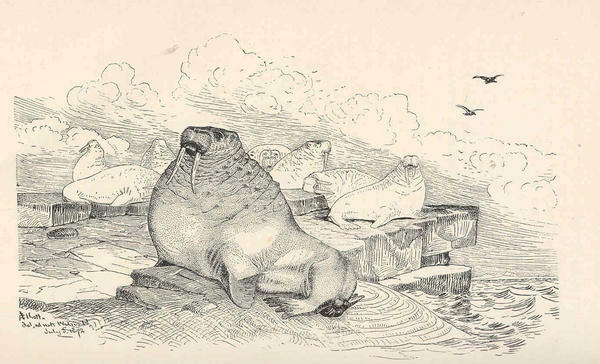 Henry Wood Elliott comments on walruses on Punuk Island in 1874, from his book Our Arctic Province. 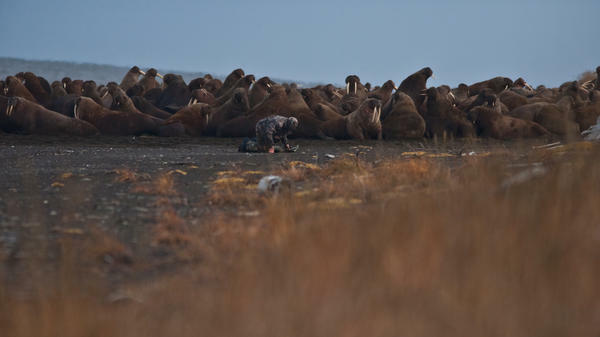 A USGS wildlife biologist works with walruses resting on shore near Point Lay, Alaska. Large haulouts at Point Lay in recent years are unusual in terms of their timing, location and number, the Fish and Wildlife Service says, and are probably tied to global climate change and decreasing sea ice. Walruses are very social animals. "They feel best when they're directly in contact with another walrus," says biologist Anthony Fischbach. "There's this constant communication they have that says, 'there's a walrus next to me, I'm OK.' "
Walrus haulouts can feature just a handful of animals, or tens of thousands — even more than 100,000. 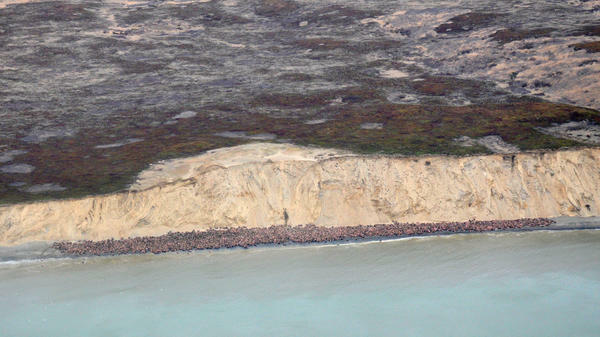 This one, at Cape Greig in southeastern Bristol Bay, has more than 1,500 animals. In 1874, when the painter and naturalist Henry Wood Elliott was observing a small crowd of walruses on the Punuk Islands off Alaska's coast, he was preoccupied with the appearance of their pustules and the precise texture of their skins. "The longer I looked at them the more heightened was my disgust; for they resembled distorted, mortified, shapeless masses of flesh," he wrote. Almost off-handedly, he noted their number — around 150, all male — before pondering their resemblance to "so many gnomes or demons of fairy romance." 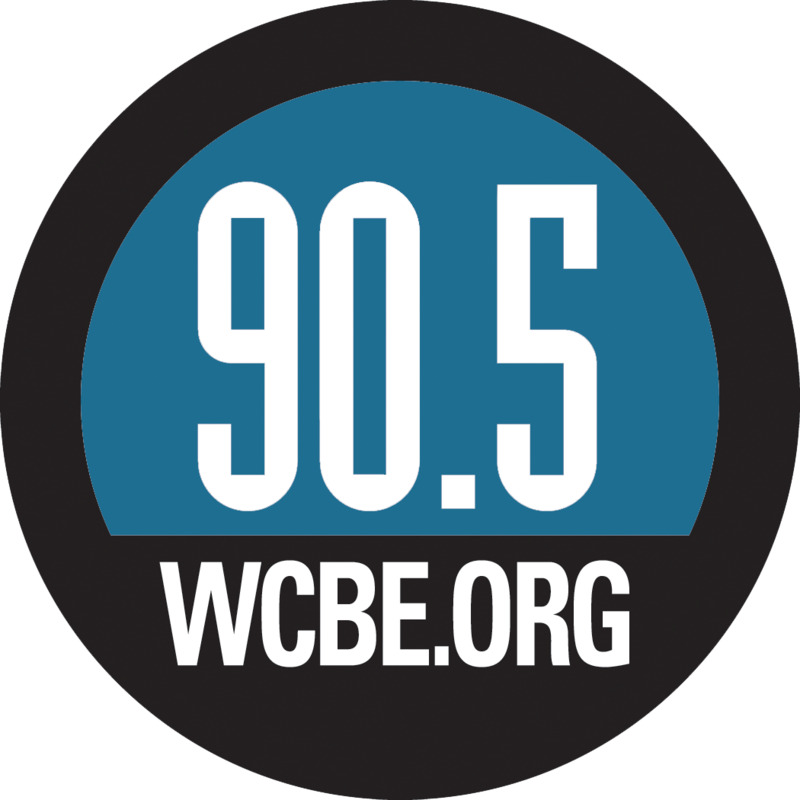 "Latitude: 63.08049. Longitude: -168.80936. ... more than 150 male walruses hauling out here during August of 1874." And it's all thanks to Native hunters, Victorian explorers, aerial observers, anthropologists, biologists, geologists, conservationists and librarians. On one level, walrus haulouts — a group of walruses resting on land together — might seem straightforward. Walruses feed off the ocean bottom, but they can't stay in the water 24/7. They can flop on ice floes for naps, especially when there's plenty of sea ice around, but sometimes they rest on land instead. And if they're gathering on the shore, well, safety in numbers, right? But even to experts on walrus behavior, there's something mysterious about a gathering of animals — sometimes 100,000 or more — on a specific patch of beach. "You spend all this time trying to get to them, and then you get to them and they're all there," says Tony Fischbach, a wildlife biologist and co-author of the new database. "You've walked for miles down the beach or you've flown for 50 miles, and you get to them and you say, 'Why are you here? Why are you not at the place that's closer to where you get your groceries?' "
Walruses will gather in hordes at places that seem, to human eyes, no different from the empty stretch of beach next door. It's not always the closest to their food supply. They'll visit the same spot summer after summer — and then one year they'll disappear and pop up somewhere else. These shifting, city-sized gatherings are actually dangerous for walruses. When they get disturbed — by a polar bear, or a photo-snapping tourist, or a buzzing airplane — there's a mad scramble for the sea. Walruses are frequently killed in the chaos. 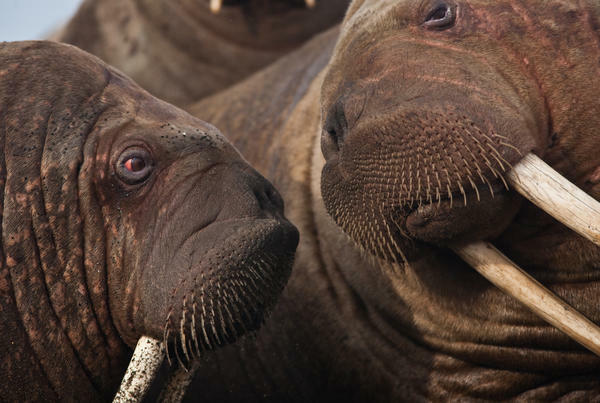 "Those are 2,000-pound animals that are panicked and running, and running over the top of each other," says Ed Weiss, a biologist who manages the Walrus Islands State Game Sanctuary. "If you've got small or young ones in the herd, they can get crushed." Even survivors can be negatively affected, Weiss says. "They're hauled out on the beach for a reason — to rest and regain their energy," he says. "If that's interrupted on a regular basis, it can have long-term consequences." Stampedes are especially dangerous for female and juvenile walruses, which are smaller. So those walruses prefer to stick with the sea ice, in small groups close to the water. But with climate change, the sea ice in the Arctic is shrinking, pushing females and juveniles to new haulouts on land. At the same time — and for the same reason — more and more marine shipping routes are opening up, increasing the risk of disturbance. The new database demonstrates shifting haulout patterns. It's meant not just to document Pacific walruses but also to protect them. The curious behavior of walrus haulouts has been noticed since time immemorial. Walrus-hunting communities, including the Chukchi, Yu'pik and other Native cultures, had generations' worth of knowledge. Explorers such as Elliott observed haulouts in ships' journals. Biologists kept records wherever they were working, and more formal tracking efforts and surveys have been in place for decades. But those records were scattered in various sources, and some of them were locked away in government archives. Fischbach and his colleagues spent more than a decade discussing the need for an organized database before buckling down to create it. And instead of just gathering the recent scientific surveys, they pulled in Native oral histories and Victorian ships' logs dating back to 1852. "Because walrus haulouts are always shifting around, the best way to understand where those locations may be is to understand where they've been reported before," Fischbach says. "And some of those that have been reported long ago, they may be used again." The wide-ranging sources often proved tough to find. Sharon Prien, an interlibrary loan specialist at the Alaska Resources Library and Information Services, worked on the project for about two months — tracking down more than 70 old books and articles, often written in Russian, which she doesn't speak or read. "It was a trick," she says, laughing. Her quest took her to archives and catalogs in Russia, Canada and the continental U.S.
Then the researchers worked to clean up the data — gathered and described in very different formats — into something that could be plugged into Google Earth or other mapping programs and return a history of where, when and how many walruses have been observed. Now those records can be accessed by anybody. The FAA, for instance, will use it to alert pilots of places where they should avoid flying. In the event of an oil spill or shipping accident, emergency response teams can quickly see areas and time periods where they should be concerned about walrus activity. Hypothetically, it could also be used by people who are looking for walruses (harassing walruses is illegal, for the record). But Fischbach says he and his colleagues believe walruses are fairly easy to locate if you're seeking them out — but, without a tool like their database, far harder to avoid for planes and ships that are just passing through. In compiling the database, the scientists reached back in time and collaborated across disciplines. They also worked across a sometimes contentious border, as Elizabeth Jenkins has reported. Jenkins is with member station KTOO and Alaska's Energy Desk. Both Russian and U.S. scientists were vital to the project — and in fact, people from both countries have been working together for decades to share information on walruses and coordinate research. "Even the Cold War was not able to stop this work from happening," Anatoly Kochnev, another co-author of the database, told Jenkins in Russian. "Walruses are not political and do not respect any political boundaries."